Having avoided the rain predicted for most of the week, a wet start to the Borders Confined Tournament’s finals day didn’t dampen the quality of tennis. 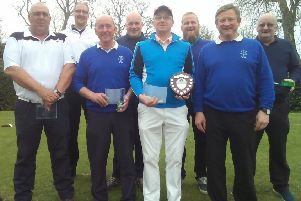 The event, held at St Boswells, saw players from across the Borders competing over the last week in June. Finals day on the Sunday opened early as Niklas Stingl (Kelso) played Gregor Eadie (Selkirk) for the men’s singles title, which ended with Nik regaining the trophy with a strong win in two sets. The longest match of the tournament, at two hours and 40 minutes, was the ladies’ singles final, which saw Hannah Bagley (Berwick) successfully defend her title against Claire Townsend (St Boswells). With both players winning one of the first two sets in a tie-break, spectators truly settled down to a tight third set, in which Hannah prevailed 6-4. In almost a repeat of last year’s men’s doubles final, Lee Brown this time partnered Niklas Stingl in a close match which saw the Kelso pair win against Ian Reilly and Iain Laidlaw (Melrose). The ladies’ doubles saw Peebles take on Duns as Lisa Campbell and Juliet Smith won in two sets against Judith Dixon and Helen Forbes. The day was rounded off with the mixed doubles finals as Niklas Stingl, playing his third final of the day, partnered Tara Harvey to a win over Berwick pair Hannah and Ross Bagley. Tournament secretary, P.J. Harding, said: “We had a really fun tournament week with some excellent matches and what felt like a record number of tie-breaks. St Boswells Tennis Club was an excellent host yet again and Elspeth Whitelaw, tournament referee, did an amazing job once again.